Today marks the start of the first full day of sporting action at the 2010 Winter Olympic Games being held in Vancouver, Canada. With all the skiing, snowboarding, ice hockey and such like being shown on the television over the next two weeks we thought we would post up a picture of an Ice Age scene. The picture below was created by designers at the German model manufacturer Schleich to promote their prehistoric animal model ranges. It is sad to report that a number of models from this range have been retired this year. The Cave Bear and Giant Ground Sloth (Megatherium) are no longer available. However, the Mammoths and Smilodon are still in production and this scene is part of a longer montage which also depicted a Sabre Tooth Cat. 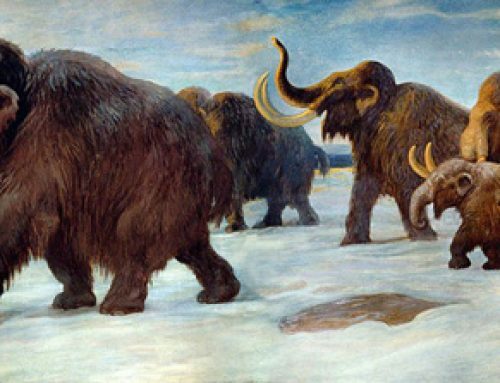 The scene shows two adult Mammoths and a youngster in the snow with a background of high snow-capped mountains.